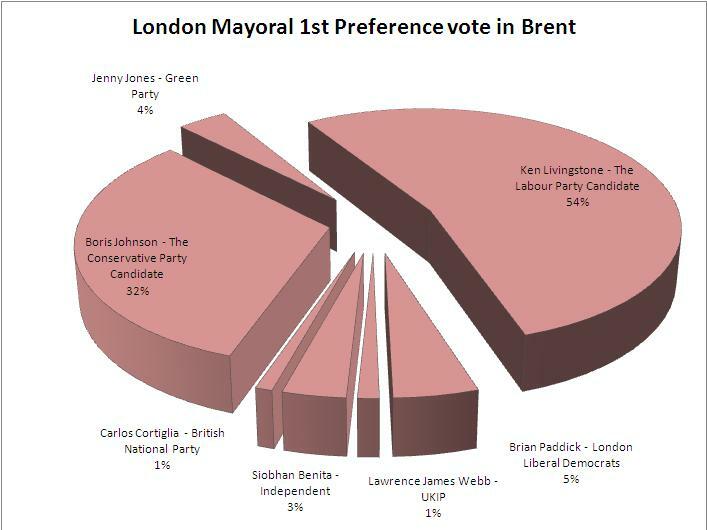 Ken Livingstone polled more than all other candidates put together in Brent! Specific data released on the London Mayoral 2012 elections has revealed that former Brent East MP Ken Livingstone polled more than all the other candidates put together. Ken Livingstone won 54% of first preference votes, winning 22% more votes in Brent than the eventual winner of the overall election Boris Johnson who won 32% of the vote in Brent. The vote spells bad news for the Liberals who’s candidate Brian Paddick only polled 5% in Brent. There was more encouraging signs for Labour as Brent and Harrow London Assembly Member Navin Shah was the highest polling candidate in every single Ward in Brent. There is a huge drop in Lib Dem in Brnet with them coming an embarrassing third and even fourth in some wards where they have three Councillors! I’ll blog further on this later. Posted on May 16, 2012 by Cllr Krupesh HiraniPosted in Brent, Election, Liberal Democrats, LondonTagged Boris Johnson, Brent & Harrow, brent election results, Brian Paddick, Ken Livingstone, Labour, London, London Mayor, London mayor votes Brent breakdown, London Mayoral votes, Mayor of London, Navin Shah.